Hello World. This is Próximo. An introduction and call for early adopters. Ever since the slow death of Dopplr after its acquisition by Nokia a decade ago, the internet has lacked a dedicated space for people to casually share their travel intentions. Back in those days, it was also a feature of trip planning services like TripIt which since then pivoted to booking management for frequent flyers and real-time notifications when things go out of the route. With the ubiquity of smartphones, it made a lot of sense for social network platforms to propose services that focus on the instantaneous, the moments and the now. The fascination of the Big Now has been the major trend of the current version of the internet. For some of us — regularly on the move — the practice of documenting familiar destinations and travel intentions demands its own casual and intimate space. This is what Próximo provides. In consequence, I have observed people using multiple channels like emails, Facebook, Twitter, WhatsApp to share their travel plans and request knowledge about destinations from their online contacts. And almost inevitably, I have noticed how that information would get lost in the noise of overfed inboxes or get buried within minutes under endless social media feeds. For some of us — regularly on the move — that practice of documenting familiar destinations and travel intentions demands its own casual and intimate space. This is what my recent pet project Próximo provides and I need your help to figure out how it can better cover that need. Próximo /ˈpɾoɡsimo/ means nearby and upcoming in Spanish. I have conceptualized, designed, developed and deployed it thinking about travelers who perform any of these habits: the record keepers, the connoisseurs and the prospectors. You regularly transform what you hear and see about destinations into reminders, notes or references. 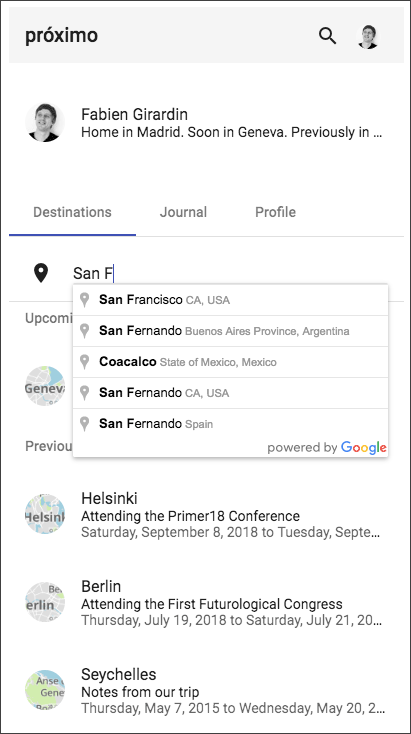 You have probably already tried Google Maps, Evernote or travel planning apps to organize them. Próximo offers a natural way to further support that practice. 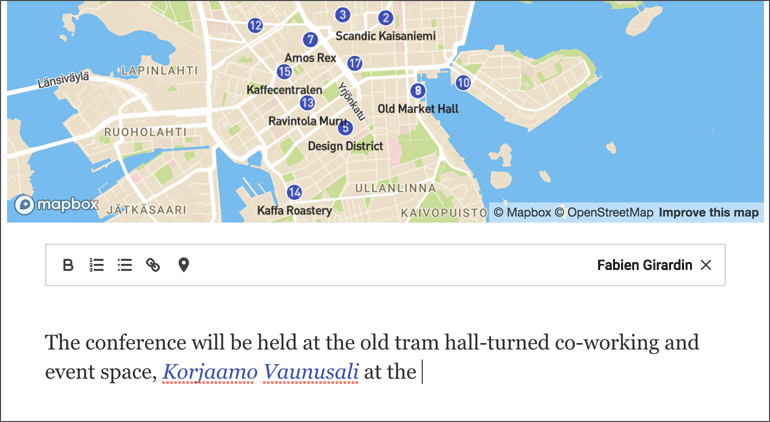 You can both provide context to your notes like in a travel guide AND easily map the relevant places. 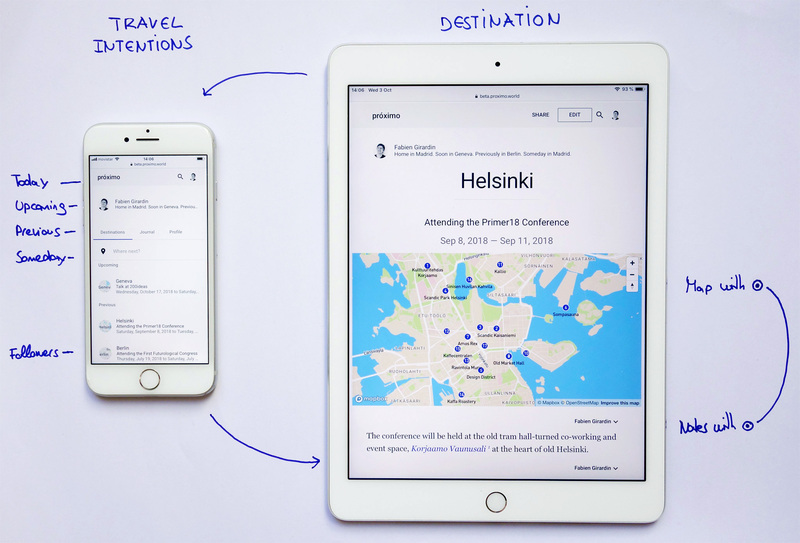 Provide context to your notes like in a travel guide AND easily map the relevant places. You have good tastes and your friends, colleagues and family know that.You respond to email/social media requests for personal recommendation about the cities and destinations you are familiar with. In Próximo you can write brief notes tailored to your vegetarian coworker, his sister on her honeymoon, that shopaholic colleague, the foodie friend on a weekend wedding anniversary without her kids or a cousin on a business trip. Keep brief notes as reminders for yourself or tailored to a specific audience. You ask around for ideas, suggestions or personal anecdotes to step away from the beaten path. You are also good at browsing the web for hours to spot that special sunrise place in Maui or that unique capsule hotel in Kyoto. In Próximo, you can keep notes of your research and invite friends to contribute with their thoughtful words, recommendations or stories based on who you are. Disclose your travel intentions and invite friends to contribute with insights. If any of these habits sound familiar and you feel intrigued, I invite you to try Próximo. Currently, it is web-based service hosted on proximo.world and you need a Google account to sign in. It is built on the latest secure web frameworks and technologies (MEAN stack: MongoDB, Express, Angular, and NodeJS). You can delete your account at all time if you are not convinced or no longer want to use Próximo. Click the “Delete Account” in your “Profile” panel and all your data and texts will be deleted immediately. Like an amateur painter I mainly create software like Próximo for myself. Keeping my hands dirty helps me think better as a professional. I am honored if a few people find the result compelling or inspiring. However, I never fall into the distraction that every idea must scale. This is human scale technology, built for a few, not the whole world. It is the best scale to learn. I would love to hear from you or anybody you know who might be interested. Thanks for spreading the message. Feel free to comment or contact me. At Near Future Laboratory we regularly engage into prototyping and envisioning exercises that explore how people negotiate their relation with time and space via digital technologies. For instance: Slow messenger, Humans, Memento, Omata and now Próximo. Context: this month I’ve been invited by Anab Jain to give the introductory workshop to the Design Investigations program at the Angewandt (University of Applied Arts Vienna). This is the brief. “field research” methods that rely on observation, participant observation and interview techniques in order to understand social and cultural context. Beyond the purely ergonomic and functional dimensions, such understanding is thus a fundamental component of current design in order to inspire, constrain, adapt and define the design space in an innovative and original way. Moreover, this understanding aims to overcome the stereotypes of a "user-centered design" that is often not sufficiently concerned with the complexity of individuals' uses and practices, as well as the major role of the surrounding context in the people’s motivations. In this studio, students will learn how to employ design ethnography in the context of a small project focused on the digital infrastructure of urban everyday life. Surveillance cameras, routers, traffic sensors, mobile phone towers, WiFi antennas, cables such as copper wire or optical fibers, data centers, server farms... All of these correspond to the tangible underpinnings of the so-called “virtual interactions” people have with their computers and smartphones. The urban environment, more than anywhere else, is filled with such devices and the myriads of services they rely on, ranging from repair phone shops fixing broken screens and bloated operating systems, to maintenance teams changing underground cables. Networks of New York, Ingrid Burrington. Although these technological components are fundamental, they are often invisible and unbeknown to most of us. Their existence, often dismissed as banal and purely technical, is, however both fundamental as they shape our social and political interactions. Interestingly, there has been an increasing interest from designers, artists and social scientists towards them (see references). Based on a series of observation, interviews, and possibly research interventions (participant observation, use of non- working prototypes, probes), students will explore the potential of the digital infrastructure of the urban environment in product/service/interaction design. Can they be repurposed for other more inspiring usages? How can we combine these technical elements in order to build more habitable near-futures? Can one take advantage of existing flaws/limits? Can we protect citizens from their overwhelming presence? Output2: an object that presents their design concept about how to take advantage of the digital infra/network. This may be done through objects, a short film, a performance, a series of drawings or visualizations; it is up to the students to select the most appropriate resolution for their outcomes. These two artefacts will be presented orally the last day of the workshop. Perec, G. (2011). Thoughts of Sorts, Notting Hill Editions. Perec, G. (2010). An Attempt at Exhausting a Place in Paris, Wakefield Press. Smith, K. (2008). 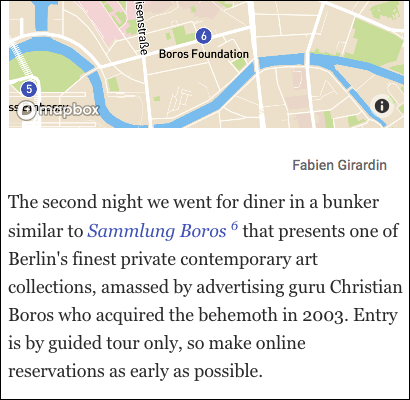 How to be an explorer of the world : portable art life museum. NYC : Penguin Books. Causey, A. (2016). Drawn to See: Drawing as an Ethnographic Method, Toronto: University of Toronto Press. Weiss, R.S. (1995). Learning From Strangers: The Art and Method of Qualitative Interview Studies. Simon & Schuster. Dourish, P. (2006). Implications for design, in Proceedings of the conference on Human Factors in computing systems (Montréal, Québec),pp. 541–550, ACM. Gaver, B., Dunne, T., & Pacenti E. (1999). Cultural Probes. Interactions, 6 (1), 21-29. Goodman, E., Kuniavsky, M. & Moed, A.(2012). Observing the User Experience: A Practitioner’s Guide to User Research (2nd ed. ), Morgan Kaufmann. Nova, N. (2014). Beyond Design Ethnography. Berlin : SHS Publishing. Available at the following URL. Portigal, Steve (2013). Interviewing Users: how to uncover compelling insights. San Francisco: Rosenfeld Media. Arnall, T. (2014). Exploring 'Immaterials': Mediating Design's Invisible Materials. International Journal of Design, 8 (2). Augé, M. (1995). Non-places: Introduction to an anthropology of supermodernity. London: Verso. Burrington, I. (2016). Networks of New York: An Illustrated Field Guide to Urban Internet Infrastructure. NYC: Melville House; Ill edition. Gabrys, J. (2016). Program Earth. Environmental Sensing Technology and the Making of a Computational Planet. Minneapolis : University of Minnesota Press. Star, Susan Leigh (1999): "The Ethnography of Infrastructure", American Behavioral Scientist 43, pp. 377‐91. Sherpard, M. (2011). Sentient Cities: Ubiquitous Computing, Architecture, and the Future of Urban Space. Cambridge: MIT Press. Varnelis, K. (2009). The Infrastructural City: Networked Ecologies in Los Angeles. Actar.